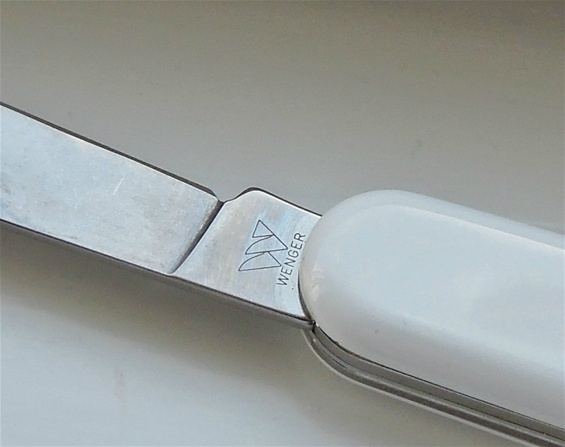 This is my latest Wenger knife and it is the same as the Classic 11 only with white scales. The difference between the Classic 07 and 11 tool configuration is the corkscrew and phillips screwdriver. 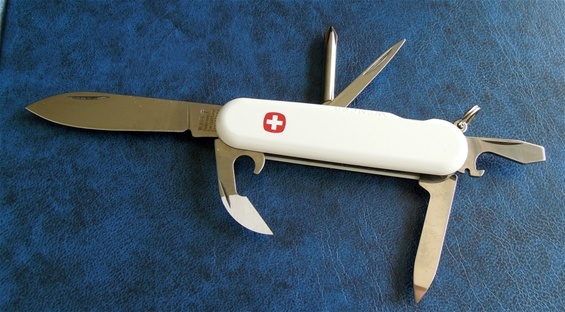 In the history of Wenger Swiss army Knives you will find the model names Trailblazer & Highlander on the Classic 11. There are different names in history and I would believe there are different identifications. My knife got tweezers and toothpick in the scales and it got the key ring. It is fully possible that this knife got changed handle scales at one point or it’s been used for display purposes. If not it is original with white scales and even more special. I am also happy that the blade got the three knife logo with Wenger name on the backside of the tang. This is rarer to find after 2008 but again this is my impressions so far and it is a type of backside stamp that is from the late 1980s. It was part of the blade stampings for a very long time and it appeared from time to time until 2013. There will always be production variations and company variations I would believe. The Three knife logo looks like a W and with great purpose. W for Wenger in a double understanding. The field for the nail file is reversed and this is usually found after 2004. 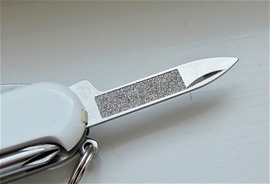 It is a good evolution and it was welcomed by many because you avoid scratching the blade when opening the nail file. The Classic 11 name is usually always for the red handle that is most easy to identify and should be red. 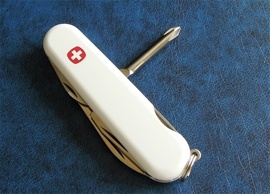 In some cases you may find Classic 11 used for a knife with a different color. Some would use the SAK name that are easy to identify with for example Trailblazer! I do believe that that the Highlander name and knife did not usually have tweezers and toothpick. Remember that the Company Wenger got very many variations in history. For those that are extra interested in stamp evolution and variations then there are variations and changes to be found on the three knife logo and stamp. One variation is the falling letters type on the old. As you know there are a multitude of different handle colors on SAKs. White is really not a color but it is very classy i feel. I would like to mention the main blade used on the 85mm Classic and Evolution models. I do not have the complete date on the new grind and shape on them. Usually it is after 2004 with some variations. Do not forget to check the tip or towards the tip part of the main blade. Some of them are thicker and it is not only a new redesigned knife blade but I believe it is improved. It is interesting for sure! The edge is also different and more modern in production I believe. 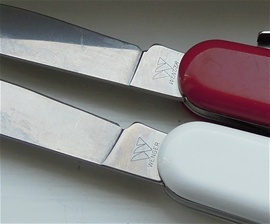 If you look on Wenger knives you will find thickness variations all the way in history.